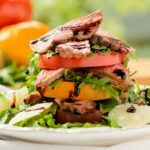 Make this healthy, quick and easy recipe for steak and heirloom tomato salad with balsamic glaze for a delicious meal any day of the week. Bring vinegar to a boil in medium saucepan; reduce heat and simmer 20 minutes or until reduced to about 1/3 cup (consistency will be syrupy). Remove from heat; cool. Season with 1/2 teaspoon salt and 1/4 teaspoon pepper. Whisk in oil. Press thyme and garlic evenly onto beef steaks. Spray large nonstick skillet with cooking spray; heat over medium heat until hot. Place steaks in skillet; cook 8 to 11 minutes for medium rare (145°F) to medium (160°F) doneness, turning twice. Carve steaks into thin slices. Arrange arugula and tomatoes on serving platter; drizzle with Balsamic Syrup. Top with steak slices; sprinkle with 1/2 teaspoon salt, 1/4 teaspoon pepper and cheese shavings.